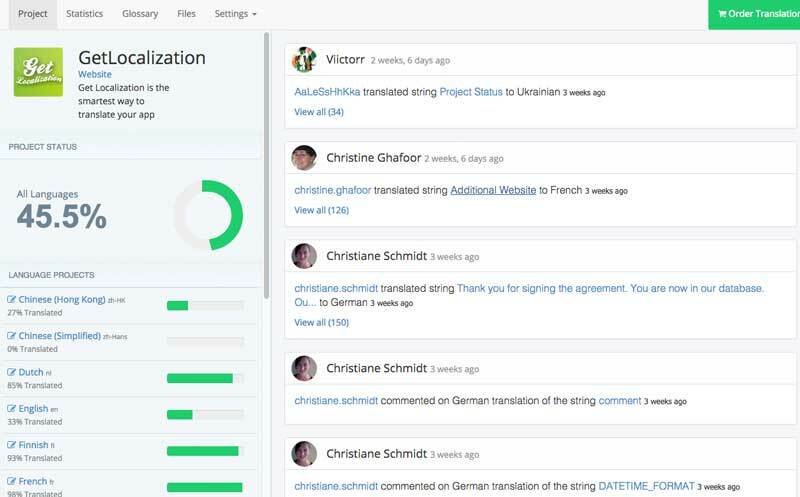 Get Localization Workspace received an update and facelift today. We have been refactoring our existing system profoundly. The new version brings multiple improvements to various functions. Most of the improvements are actually in underlying infrastructure but the Workspace UI also got a complete overhaul. I’ll highlight few of the improvements now. Workspace Dashboard is now completely different, as we have made the timeline into the most prominent element. It’s a great tool for following in detail how your project is moving forward. You can now see at a glance what is happening. Statistics have been completely rewritten: they are faster and it’s easier for you to find detailed data. We know that companies use different units in their invoicing: words, segments or even characters; and have now taken this better into account. You can also inspect the data based on different attributes like language or date and get those results as a nice graph and also in a tabular format for additional manipulation. Due to the nature of the existing statistics and new stats system, it doesn’t make sense to bring the old data to our new system, so those who are working with old analysis page and data can still use it for invoicing until the new statistics system contains enough data for your billing period. We have now unified our order infrastructure which allows us to bring more cost-efficient translation also to Workspace customers. Packages (Silver, Gold etc) are gone and now you simply pay per word. There will be also new Order API which let’s you streamline the ordering process even more so that it’s fully automatic. It will be out later this summer. However the new Order UI and cheaper prices are available already today. New notification system, faster file imports, announcements & better information sharing are just a few of the new features we’re featuring here. The new underlying technology and user interface allows us to add and improve new features faster than ever. We listen your feedback as always, so please keep it coming.